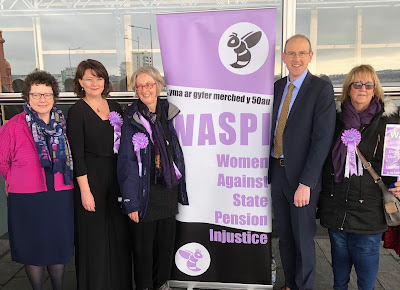 Plaid AMs Elin Jones, Leanne Wood and Llyr Gruffydd with WASPI campaigners outside the Senedd today. Plaid Cymru has said that 10,000 women in Wrexham and Clwyd South who have lost out over State Pension age changes should be awarded compensation for their losses. Plaid Cymru tabled a debate on the controversial changes in the Senedd today, with North Wales AM Llyr Gruffydd stating that Plaid Cymru was “fully behind” the women campaigners. Thousands of women born on or after 6 April 1951 have had significant changes made to their State Pension age without them knowing. The campaign Women Against State Pension Inequality (WASPI) is calling for “fair transitional state pension arrangements,” which they say translates into a ‘bridging pension’ paid from age 60 to the State Pension age. They also advocate compensation for losses for those women who have already reached their State Pension Age. An estimated 138,600 women in Wales are affected by these changes which has left thousands of women facing poverty, financial insecurity or ill health. 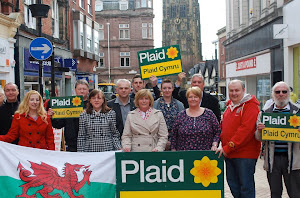 They include 5,000 women in the Wrexham constituency and 4,600 in Clwyd South. “Despite many paying full National Insurance Contributions all their working lives, these women have been told at the last minute that the pensions they had expected at age 60 would be delayed by up to six years. “This fiasco has caused retirement plans to be shattered and women who have planned and saved for their retirement are living on dwindling limited savings until they reach their new State Pension Age when the only income they will have left will be their State Pension. The consequences of this poor implementation and communication are likely to be poverty, loss of independence and financial security, or ill health. “Women in Wales have been particularly hit hard by the British Government’s failures. Income per capita is lower than it is in other parts of the UK, and, on top of that, women in Wales earn less, on average, than the men of Wales. “We know that we need to introduce equality in terms of the state pension age, but we need to do that over a longer time frame and give an opportunity to women to prepare properly for their future and in a way that doesn’t leave them in poverty and distress.